The redeveloped Central Park Apartments in Brooklyn are part of a joint programme by the Wellington City Council and Government to upgrade social housing over the next 20 years. The 190 unit multilevel complex, originally built in 1975, was reopened in October 2012. It provides a safer environment, earthquake strengthened buildings and additional community facilities. 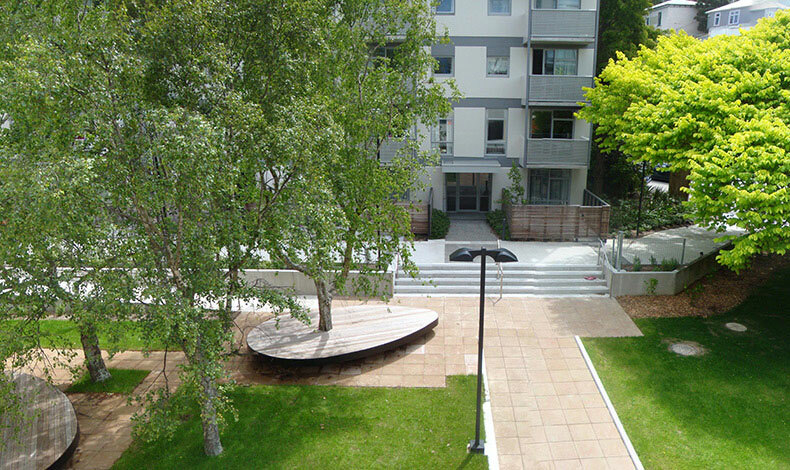 The central courtyard, with well established trees, was the focus of landscape improvements and community activities. By removing roads within the site, forming a new vehicle access, and creating new pedestrian links through the site and to new community rooms, the central green space is now a significantly improved environment for tenants. Timber screens separate private courtyards from public space. New steps and ramp access to the community rooms and ramped access to ground floor units give greater accessibility. The complex has been made a much safer environment by dividing housing blocks into smaller units, having upper units overlook public areas, improving exterior lighting and installing clear wayfinding. New community rooms open out to the grassed central court, with deck seating and fruit trees.